Anusha Perera of St. Sebastian’s, Moratuwa and Sahan Dharmakeerthie of Ananda Sastralaya dropt into the lead in the Sunday Observer/Mobiel Most Popular Schoolboy Cricket of the Year 2013 after the vote count on Coupon Number 13 in the Platinum Division and Silver Division respectively. In the Platinum Division, Anusha Perera of St. Sebastian’s College, Moratuwa topped the list with 30,106 votes with Minal Abeysekera of Royal in second palce with 29,874 votes and Manhaj Jaleel of Thurstan in third place with 29,369 votes. 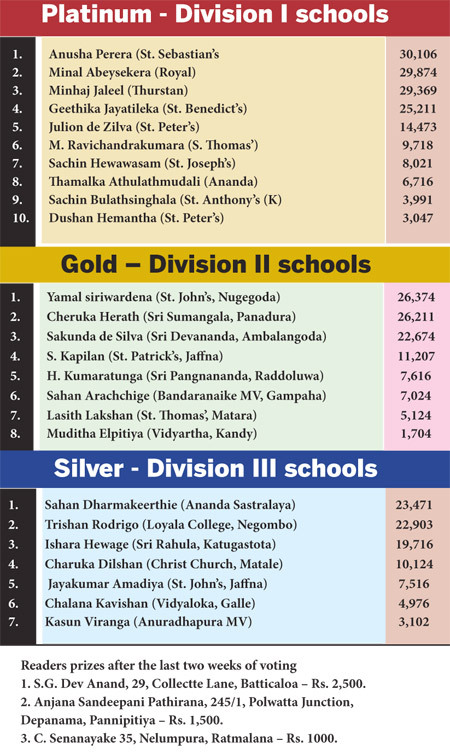 In the Gold Division for Division II Schools, Yamal Siriwardena of St. John’s, Nugegoda kept his place of last week and he in the lead with 26,347 votes and Charuka Herath of Sri Sumangala, Panadura is in second place with 26,211 votes. Sakunda de Silva of Sri Devananda, Ambalangoda is third with 22,674 votes. The Silver Division for Division III schools, saw a change with Sahan Dharmakeerthie of Ananda Sastralaya coming into the top spot with 23, votes add Trishan Rodrigo of Loyala College, Negombo drops down one palce to be presently second with 22,903 votes. Ishara Hewage of Sri Rahula, Katugastota is third with 19,716 votes.